Anna Hayli: How Does It Work: Primer? How Does It Work: Primer? Primer is a product that is use by a lot of people nowadays. There are a lot primers out there now and all of them have pretty much a different purpose. That's a good thing, because everyone is looking for something else in a primer! Me for example, I am looking for a primer that keeps my face matte as long as possible, that makes my pores less visible and that makes my makeup last all day. BUT today we're not going to talk about primers that work and don't work for me, but how primers do work. Why do they make your makeup last longer? How do they make your face look smooth? How do they make your face look longer matte? I am going to answer these questions for you today! I use primer after I apply my skincare and before I put on makeup, because 1) I once read that it acts as a barrier between makeup and your skin, so it prevents your own produced sebum from breaking down your foundation/makeup and 2) it's a primer, so it should be the base of your makeup. I have used a few different primers and two of them are silicone-based, which we are going to talk about today. Silicone polymers are the most used ingredient for primers. Silicone-based primer are said to be the best for oily to combination skin. 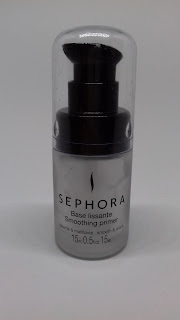 These kind of primers are mostly used for its smoothing and mattifying effects. The consistency is smooth and slippery, it feels like silk pretty much and when applied to your face, it leaves a velvet-like finish. Silicones are very popular in primers, because they're supposed to have a ultra-smoothing effects and they're also heat-resistant, so your makeup won't melt off and it also smooths out your pores, wrinkles and fine lines. The silicone will make your makeup adhere to your face and that's how a silicone-based primer make your makeup long-wearing. Even though silicone-based primers feel so smooth, it's almost like oil, they're very suitable for oily skin, because there's no oil in them, they don't melt off your face and they are also mattifying. I personally don't like them. I have to say that I only used two low(er) budget silicone-based primers. I never used the popular Smashbox Photo Finish Foundation Primer for example. They might be suitable for oily to combo skin (me! ), but I don't like the fact that they're so slippery. It gives me the feeling that my makeup goes on very smooth, but also glides off right away. I have used a different kind of primer and I prefer that primer much more, because when I applied my foundation, it felt like it stuck to it way better than to the silicone ones. However, silicone-based primers do make my makeup last longer than when I am not using a primer, but it is less mattifying than Kiko's Matte Face Base, for example.